MIDFIELDER Alex Lawless has been backed to win the Hatters supporters over after his contract was extended last week, writes Mike Simmonds. The 29-year-old, who signed from York City in November 2010, was awarded another deal after an appearance clause was activated. 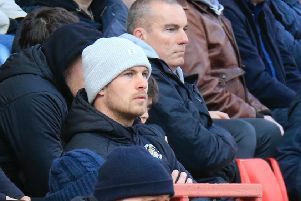 It had been a tough season for the midfielder, who broke his hand when punching a dressing room wall at York, and had become a target for some fans. But boss Paul Buckle was delighted the midfielder agreed to stay at the club after a full and frank discussion about his future. For the full interview, see the Luton News/Dunstable Gazette on sale now, while for all the latest Luton Town FC news, reports, stats, player profiles, live match updates, prediction table and a complete fixture list, visit our Hatters Microsite.